I mostly don’t feed Cedar. She feeds herself. And does a bang-up job of it. I’m a big believer in starting solids by sharing what you’re eating. With Norah, we never bought baby food. Jar food seemed wasteful in packaging and unappetizing. We mashed up sweet potatoes, pureed peas, ground cereals. 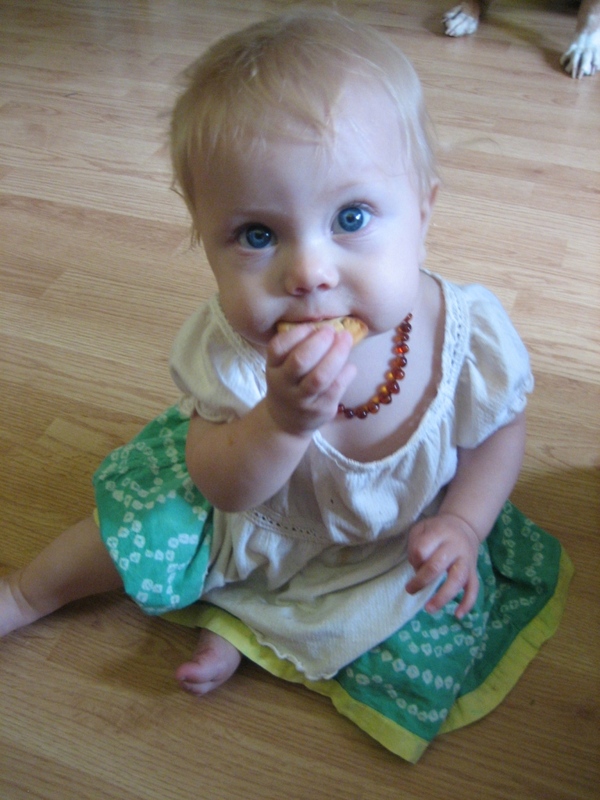 Then I learned about baby-led weaning. It goes like this: The gag reflex in a baby is near the front of the mouth. When you spoon-feed, you bypass this protective gag reflex. When baby feeds herself, the gag reflex offers a safety mechanism. It also gradually moves farther back in the mouth as she matures. So this time around, I started with finger foods. Very soft foods like bananas, avocados, small pieces of sweet potato. And she mastered them quickly. Of course, I still use a spoon sometimes. Namely with yogurt and at restaurants. But Cedar is practicing now with a spoon and learning to do it herself. And even without teeth, she eats small chunks of chicken and turkey, roasted beets, and rice crackers. It makes sense to me. It has worked well for Cedar. And we’ve only had a few minor choking moments, usually on bits of bread. I love watching babies explore textures and spices. Cedar loves lemons, pickles, cinnamon, and spicy beans and rice. One thing, though. 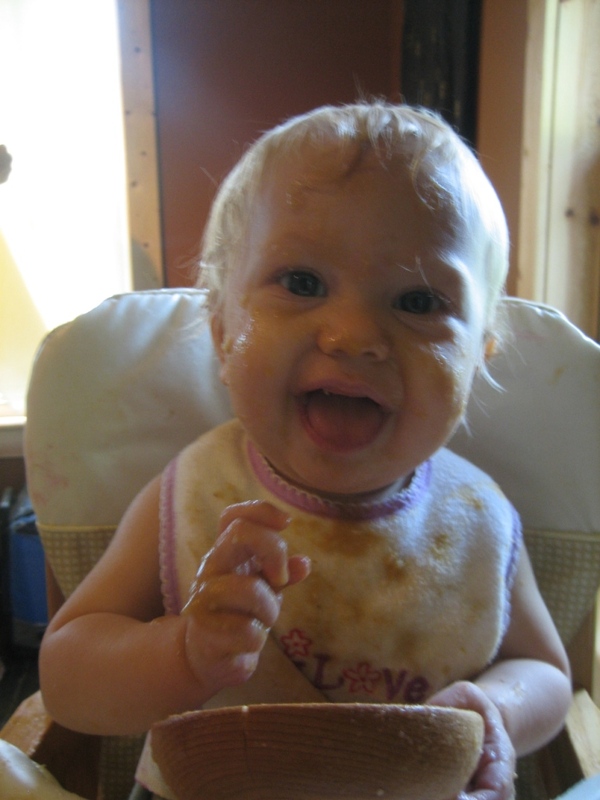 Baby-led weaning is messy. Oh yes indeed. 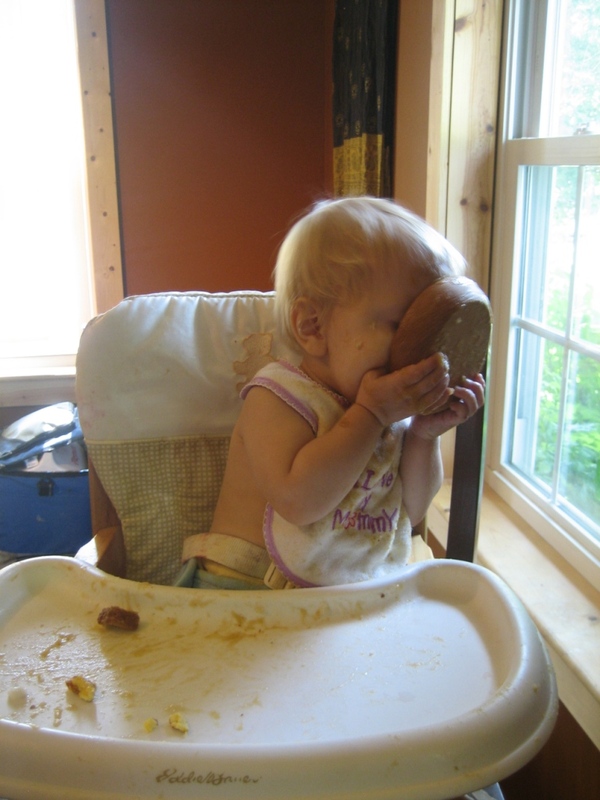 Posted in Food and tagged baby-led weaning, solid food, starting solids. Bookmark the permalink. She looks a lot like her daddy in the bottom right picture. 🙂 Oh yeah, and thank you for introducing me to the concept of BLW, since Jack chose that route anyway! We did that with Liam and will do it with Nick. Liam had a great gag reflex. We would normally just wait a moment and he would cough whatever it was back out. Personally, I’m too lazy to spoon feed a baby, with the exception of something like yogurt. When we are eating I want to eat too. Liam’s first foods where bananas, sweet potatoes and then he would gum cucumbers and tomatoes from our garden. 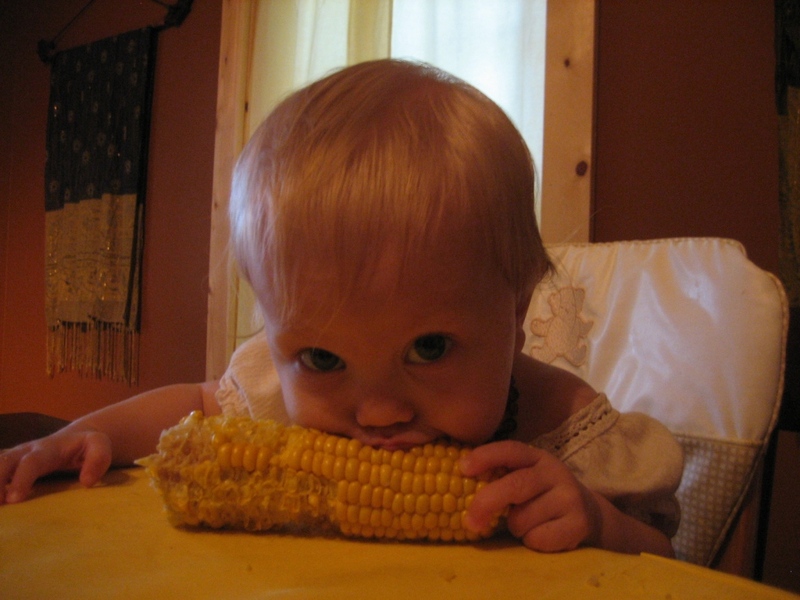 I absolutely adore the picture of Cedar chowing down on corn!!! I love the fact that you are letting her experiment with food, no baby jars of processed food. Has she tried the lentil and rice casserole yet? Can’t believe you girls were so close on Friday for your photo shoot and didn’t say boo!!!!! We did this a little with Alex but much more so with Erik. And, incidentally, we had more choking “scares” with Alex. It was as though he had to relearn where his gag reflex was. We’ve had only one scary moment with Erik – and yep, it was bread! BTW – Cedar and Norah have such beautiful, intricate little faces! Loved doing this with my daughter! It is so intuitive and so easy, not to mention cheap! It does freak the grandparents out a little but my husband and I were so glad we went this route!